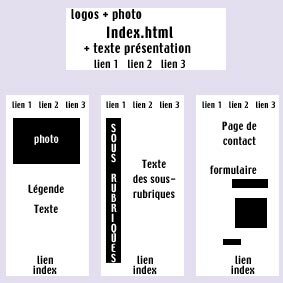 Structure of your site will describe différents links for united pages. This work is doing on paper or bloc note. Pages will be named ; you haven't to change this name after, not to break link. Dont use word whith more 9 letters, no spaces, wich are bad interpret by navigator and bots. The first page always named "index", or "main" cause it's the name navigator will search by default. Give a small description for each pages (suring barre, ergonomie graphik...), A description which can be used for title or meta names (look at chapter Promote). Example of very simple structure. Here, each pages is linking to another, to have an ergonom browse where people don't touch at the navigator. Thinking for the stucture of folder where you'll put files of your web site (for example, a folder "nameofsite", in which you find "medias", "construction", "page"...) and where you take care to put construction files in one ways, and files to go anline in another way. Here again, no spaces, no long word. If you work in groups, this stapes of creation must be important, because th plan give the sens of work for every one, and change arborescence will be a loosing time. Arborescence must be here very clear for everyone. You can think for templates, which give to your groups united for your changes.